I developed this game as part of the Chain Jam, a jam where each entry would be a 4-player 1-minute game, played in succession by the container Chain Game. TOWNQUEST is basically a super-simplified real-time strategy game. Each player starts out in possession of a town, and the goal is to conquer as many towns as possible. 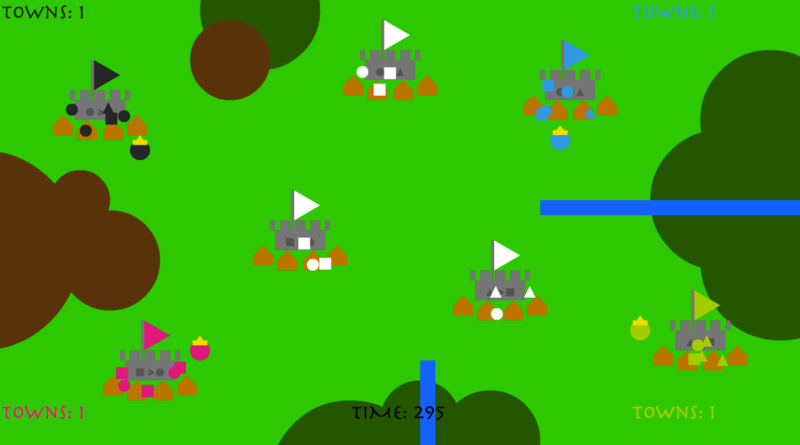 Towns spawn soldiers, which will automatically defend the town against enemy soldiers. Each player directly controls a lord piece, which they move using direction buttons. The only other button is the command button. When the player presses it, a circle appears around their lord piece, and their soldiers inside the circle will then follow the player when they move around. When the player releases the command button, the soldiers will no longer follow the player. Soldiers have some AI, where they will prioritize targeting nearby enemy soldiers for attack, while staying close to their lord while being commanded. This leads to gameplay where the player picks up soldiers from their town, moves them to a target town, and then observes the resulting fight. If needed, they can return to their hometown to bring over more soldiers. Combine this with 3 other players vying for the same few towns, and you should get some quick, fun fighting action. One more thing: there are three types of soldiers. Their attack range and so on are exactly the same, but the difference is in their intransitive relationships. Similar to the game of rock-paper-scissors, circle soldiers have an advantage over triangle soldiers, which have an advantage over square soldiers. To close it up, square soldiers have an advantage over circle soldiers. Unfortunately, the Chain Jam's 1-minute rule means that likely nobody catches this when playing the game. As a 1-minute game, it's all over too quickly to fully understand what's happening, so I made a standalone release which extends the time to 5 minutes instead.